Since 1997, we have provided quality and friendly eye care services in Mira Mesa and for the Greater San Diego area. Dr. Tony Pham grew up in Los Angeles, California. He attended the University of California, Los Angeles (UCLA), graduating in 1999 with a Bachelor of Science degree in Biochemistry. Dr. Pham obtained a Doctorate of Optometry degree from Illinois College of Optometry . He received clinical training through externships at the VA hospital in Montrose, NY, The Naval Hospital at Camp Pendleton and the Illinois Eye Institute in Chicago. 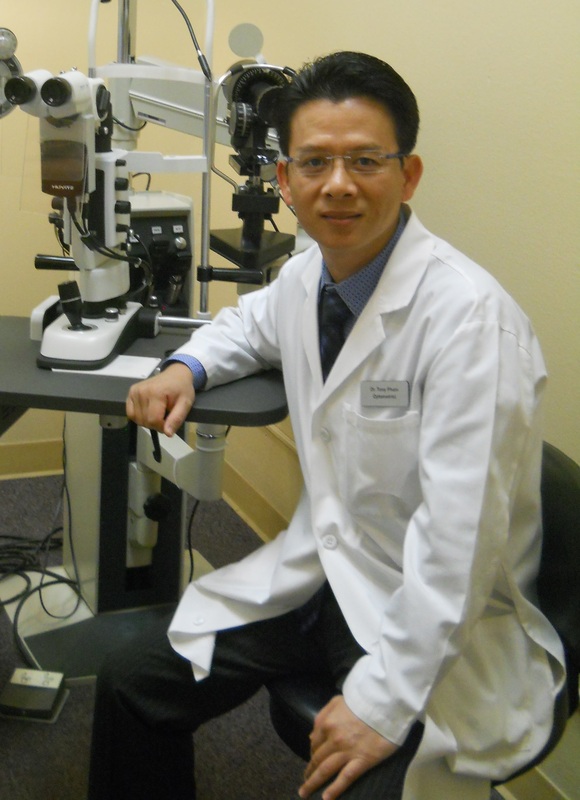 Dr. Pham is proud to serve our community as a lead optometrist of Mira Mesa Eyecare. He specializes in Pediatric vision exam, low vision exam, lasik consultation, corneal refractive therapy and vision therapy exams. He is certified in Corneal Refractive Therapy (CRT), Glaucoma treatment, Refractive (Lasik) and cataract co-management. Dr. Pham provides complete and comprehensive care including primary eye care, eye exams and contact lenses. He has committed to volunteering various humanitarian and education programs in developing nations. Dr. Pham is bilingual in English and Vietnamese, he also speaks a little Spanish. Dr. Tony D. Pham provides comprehensive eye exams for adults and children, treat and manage eye diseases like pink eyes, lazy eyes, dry eyes, various types of conjunctivitis, age related macular degeneration, diabetic retinopathy, cataracts, and glaucoma. He is also affiliated with TLC, NVISION, Advanced Eye and Laser, and The San Diego Lasik Eye Institute to co-manage and provide consultations for lasik, cataract and other types of surgeries. From routine vision tests for eyeglasses or contact lens fitting, to advance custom LASIK laser vision correction, we can provide the treatment that is right for you. Dr. Pham also specializes in fitting cone and hybrid lenses for pre and post operative corneal ocular diseases like keratoconus, and CRT lenses for night vision correction to stop myopia progression. At Mira Mese Eye Care, we provide only the most advanced eye care technology for the whole family. Our doctors are well respected and value the highest standard of care. Dr. Jamie Bergmark is a San Diego native. She attended the University of California Berkeley, earning a Bachelor of Arts in Public Health in 2012. Dr. Bergmark obtained a Doctorate of Optometry degree from The Southern California College of Optometry. She completed residency training in Pediatric Optometry, Vision Therapy & Rehabilitation at the Bright Eyes Vision Clinic in Minneapolis, MN. She also received clinical training through externships at the Naval Hospital Camp Pendleton, University Eye Center Los Angeles, and the Hellerstein & Brenner Vision Center in Denver, CO. Dr. Jamie Bergmark specializes in Pediatric and Primary Eye Care, Binocular vision exams, Vision Therapy, and Neuro-Rehabilitative Optometry. Dr. Bergmark’s passion for children includes volunteering with YMCA of San Diego County. She joined the Mira Mesa Eye Care team and practices full-scope optometry as a lead optometrist of Mira Mesa Eyecare.